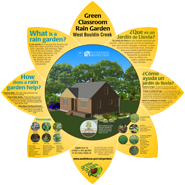 A rain garden is a low area that absorbs and filters rain water runoff that comes from roofs, sidewalks, and driveways. Rain runs off the hard surfaces, collects in the shallow depression, and slowly soaks into the soil. They are usually planted with colorful native plants and grasses. Conserves Water - Rain water helps plants grow and reduces the need for watering. Protects Water Quality - Plants help filter pollutants like: chemicals from the roofing tile, fertilizer, and litter from the sidewalk. Rain gardens come in all shapes and sizes, every little bit helps. 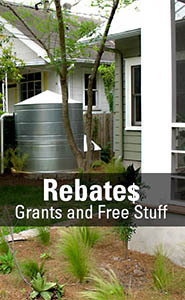 Register your rain garden bioswale, cistern, green roofs, etc today. 71 have been registered to date. See where small-scale green infrastructure is located throughout Austin. Signage - WPD will provide an interpretive sign for Austin school campuses that install and register a campus rain garden. Email us to request a sign. Click here to find out about volunteer projects. It’s estimated that the One Texas Center demo rain garden will remove 1,000+lbs of Total Suspended Solids from stormwater each year.